The NJ Senate votes against Carl Icahn's reopening the Trump Taj Mahal; NV votes for NFL stadium. China has detained 18 employees of Australia's Crown Resorts as part of its anti-gambling crackdown. This week's installment of Inside Gaming begins with a couple of stories about state legislators, the first having to do with New Jersey Senate passing a bill designed to prevent the reopening of the Trump Taj Mahal, and the other dealing with Nevada passing a bill to build a new NFL stadium. Finally we report on the sudden detaining of several Crown Resorts employees in China, seemingly part of the country's ongoing efforts to restrict gambling. The embattled Trump Taj Mahal finally shut its doors on October 10th, becoming the fifth casino on Atlantic City's famed boardwalk to close in the last three years. The question of "what next?" for the Trump Taj Mahal just got a bit more complicated after the New Jersey Senate yesterday passed a bill preventing owner Carl Icahn from holding a casino license for the property for five years, the Associated Press reports. The bill specifically prohibits anyone who closes a casino from holding its license for the following five years, although as written would only immediately apply to Icahn and the Taj Mahal, and not to the owners of the four casinos that closed in 2014 — the Atlantic Club, the Showboat, the Revel, and Trump Plaza. However the bill would restore the license if a casino's owner is able to reach a deal with union workers to reopen it — an obvious reference to the situation at the Taj Mahal where workers were on strike during its final months. Although the Trump Taj Mahal still bore the Republican presidential candidate's name right up until its final days of operating, Icahn was the owner after he helped Trump Entertainment Resorts out of bankruptcy earlier this year by making the company a subsidiary of his Icahn Enterprises. The bill still needs to go to the state's Assembly, and if passed there would move on to Governor Chris Christie's office to be signed into law. However, those following the bill believe Christie would likely veto it. Unsurprisingly, Icahn strenuously objects to the bill, calling it "unfair and unconstitutional" and declaring it would make "it virtually impossible to reopen the Taj Mahal should they decide to do so," explains the AP. So, too, does Tony Rodio, president of Tropicana Entertainment (who were charged with running the Taj Mahal for Icahn during its last days), oppose the bill, believing it will more broadly "scare away future investment in Atlantic City." "I don't see any reason for anyone to want to invest in the casino industry in Atlantic City given this adversarial investment climate being created by some leaders of our state Legislature, the same ones who are supporting the North Jersey gaming referendum that will certainly result in the closure of many more Atlantic City casinos and future disqualification of their present owners under this bad legislation," argued Rodio in a statement issued prior to the Senate vote. Rodio alludes to the referendum on the upcoming November ballot asking New Jersey voters whether or not they support amending the state's constitution to allow casino gambling in two counties in the state located at least 72 miles away from Atlantic City. A poll taken in September suggested voters may vote down the referendum, and sentiment has increased in recent weeks that it is unlikely to earn a favorable vote. Those supporting the referendum — including Gov. Christie, incidentally — are eyeing the construction of two new casinos in the northern part of the state. Read more about the bill and arguments for and against it at philly.com. Speaking of state legislators — and to follow-up briefly on a story from last week — the Nevada Assembly voted in favor of a bill that enable the raising of funds to build a new NFL stadium in Las Vegas and expand the city's convention center. Following the favorable vote by the state's Senate, the Assembly voted 28-13 in favor of the bill last Friday, then on Monday Governor Brian Sandoval signed it into law. The new legislation with raise hotel taxes in Las Vegas and its vicinity, part of an effort to raise $750 million to help finance the stadium's construction costs. The remainder of the cost for the proposed $1.9 billion, 65,000-seat stadium would come from the $650 million pledged by Las Vegas Sands Corporation chairman and CEO Sheldon Adelson and the $500 million promised by Oakland Raiders owner Mark Davis who has expressed a desire to move the franchise to Las Vegas. The move is hardly a done deal, however, as any relocation needs at least three-fourths of the current NFL owners to vote to allow it. Read more about the legislation and further arguments for and against Las Vegas building the stadium and luring the Raiders at ABC15.com. Earlier in the week Chinese authorities detained 18 employees of Crown Resorts Limited, the large entertainment and gaming group that operates both Crown Casino and Crown Perth, as part of a crackdown on the promotion of gambling in China, The New York Times reported. Among those detained was Jason O'Connor, vice president of VIP international operations for Crown Resorts. On Monday Crown Resorts issued a statement addressing the detaining of its employees, saying it was then unable to speak with them and that the company did not the reason why they were being detained. Australia's government commented as well, acknowledging they were "aware of reports of the possible detention of a number of Crown International Group employees across China overnight on 13-14 October." Eventually Australian officials were permitted to meet with two of the detained employees. The employees were arrested in multiple raids conducted as part of measures initiated by President Xi Jinping to cut down on the promotion of gambling in China. A statement from China's Ministry of Foreign Affairs referred to the Australians arrested as having "suspected involvement in gambling crimes," according to local media. In an analysis of the development, the NYT likened the arrests to a similar crackdown by China on South Korean casino chains last year when more than a dozen employes "accused of luring Chinese tourists with free accommodations and prostitutes" were arrested. "But the detention of Mr. O'Connor, a high-level executive, is raising fears that the Chinese government is seeking harsh punishments against overseas operators and ratcheting up pressure on the industry," explains the NYT. Alluding as well to Jinping's ongoing campaign against corruption, fraud, and money laundering — and its effect on the gaming industry (particularly in Macau) — the NYT speculates "the campaign appears to have shifted to casinos outside China's borders, a potential concern for the gambling industry in countries like the Philippines and South Korea, which have grown dependent on wealthy Chinese clients." 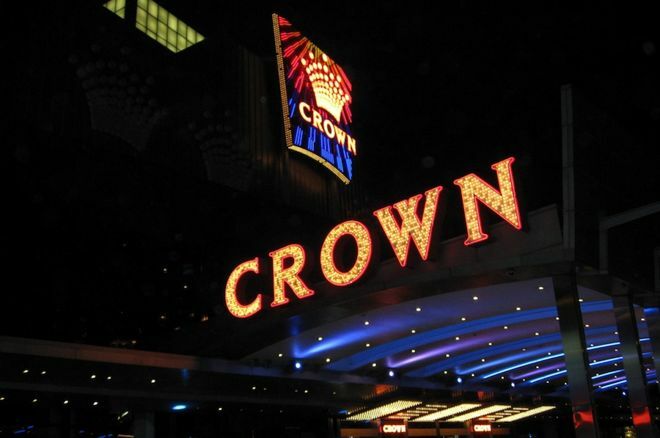 Sudhir Kale, a consultant for Crown, commented "that the vast majority of the 200 top players at Crown's casino in Melbourne are now located in mainland China." Meanwhile anxiety in Australia caused by the arrests extends beyond the particular situation of the 18 Crown employees, including as well larger concerns over the country's economic dependence on China. Visit the NY Times for more on the initial arrests as well as a larger overview of their possible implications. Photo: "Crown Casino 3," Abir Anwar CC BY 2.0.